If your functional food IQ is lacking, in this article four Colorado nutrition experts help explain what functional foods are, why you should eat more of them and their top picks to help optimize nutrition and reap greater health benefits. For example a functional food could help reduce blood pressure or lower blood cholesterol. There is, however, no single definition for “functional foods” in the nutrition and science community and currently the Food and Drug Administration (FDA) only regulates marketing claims regarding their health benefits. For this reason, many baby boomers are changing the way they eat. To improve optimal nutrition and health benefits, Adriann Pidek, a registered dietitian with Rose Medical Center, recommends people first start by consuming a well-balanced diet overall, rather than relying on any one miracle food. This includes a core diet abundant in vegetables and fruits and smaller amounts of animal protein, says Carriere. The list of functional foods that follows is a culmination of these four experts’ recommendations. The list is not exhaustive. Try to consume them as whole foods, in their natural state, rather than in processed form, which usually contains more sugar, salt, fat and other additives or fillers. Carriere also says choose ingredients that are organic, wild-caught and grass-fed. 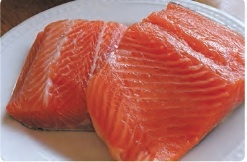 Fish are a lean protein rich in omega-3s, which help reduce and prevent cardiovascular diseases, build and support muscles, and decrease inflammation like joint pain from rheumatoid arthritis, says Crandall. Some research supports omega-3s positive impact on brain health. Eat salmon, sardines, mackerel, and herring. Serving: 3 to 4 ounces, three times per week. Wild-caught fish is also preferable to farm-raised fish since it has a higher concentration of omega-3s and farm-raised fish is higher in omega-6s, which can increase risk of auto-immune diseases, says Carriere. Nuts & Seeds provide healthy fats good for cardiovascular health, the brain, and weight control, says Johnson. 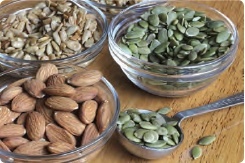 Eat almonds, walnuts and pistachios, and seeds like sunflower, pumpkin, chia and flax. Crandall encourages women with iron deficiencies to try chia seeds since they are rich in calcium, potassium and iron. Serving: 1 to 2 tablespoons total of nuts and seeds per day, says Crandall. Prunes, also known as “dried plums,” are rich in nutrients such as magnesium, potassium, and vitamin K, as well as bioactive compounds, says Johnson. They are good for postmenopausal women’s bone health to help decrease osteoporosis and osteopenia. Prunes also help fight cell damage and cancer, and improve digestion and cholesterol, says Crandall. 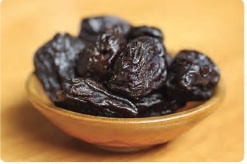 Serving: ease up to 5 prunes a day (their high fiber content may cause gas or a laxative effect in the beginning). 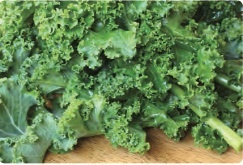 Leafy Greens are high in vitamins A, E, C, K, as well as folate, fiber, iron, magnesium, potassium and calcium. They provide antioxidants to protect cell walls, which are good for heart health, cancer and reducing cholesterol. Spinach, kale, collards, chard, and bok choy are popular greens. Serving: 2 cups, two to three times per week, says Pidek. Consume the liquid of cooked greens to increase the bioavailability of nutrients, Crandall says. 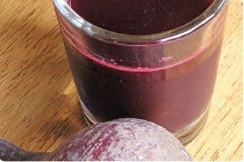 Red Beet Juice “is a powerhouse of nutrients,” rich in polyphenols, carotenoids and nitrates. When nitrates are consumed, they are converted to nitric oxide to help blood flow and blood pressure by supporting vessels and arteries. Beet juice can also help improve sport performance, says Johnson. Serving: gradually work your way to 1 cup of juice regularly. Note: In addition to possibly coloring urine and stools red, which is harmless, too much beet juice can cause a laxative effect. People with chronic kidney disease should avoid it, and those prone to kidney stones or gout should proceed with caution since it is rich in oxalates. Cruciferous Vegetables, also known as “brassica vegetables,” have high concentrations of sulforaphane and indole-3-carbinol (I3C), which research shows may reduce the risk of cancer. 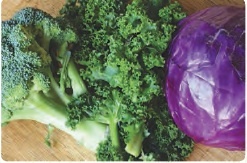 Cruciferous vegetables, especially broccoli, kale, Brussels sprouts, red cabbage and cauliflower also have anti-oxidant, anti-inflammatory and anti-carcinogenic properties. Serving: one to two times daily. People with a thyroid condition should consult their doctor for medication adjustments if they increase consumption drastically, says Carriere. 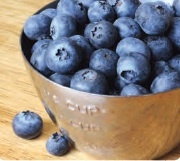 Blueberries are rich in potassium and polyphenols; great for postmenopausal women to help reduce blood pressure, provide cardiovascular-protection, and are good for the brain, liver and those with diabetes, says Johnson. Serving: 1 cup per day. 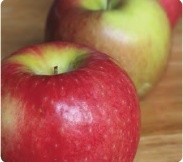 Apples have “amazing cardiovascular benefits” since they help improve lipid profiles, lower cholesterol and may play a role in colon cancer prevention, says Johnson. Serving: 1 per day. 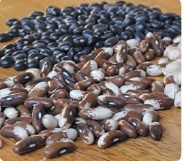 Beans can help reduce cholesterol, the risk of heart disease and colon cancer. They are high in fiber, protein, potassium and folate, says Pidek. Serving: a half cup per day. Rinse canned beans to remove excess salt. 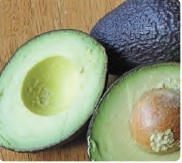 Avocados are a potassium-rich, heart-healthy good mono-saturated fat, that help maintain electrolyte balance, provide a good source of fiber and support heart contractions, says Crandall. Serving: a few slices per day or about one-fifth of a medium avocado. The FDA may increase serving size requirements to 50 grams rather than the current 30 grams.